The Roughnecks earned their third win of the season with an exciting 13-9 home win over the Colorado Mammoth Saturday night. Dane Dobbie had a mammoth game against Colorado, posting four goals and three assists. Dobbie had a hat-trick before the first half was over, scoring a shorthanded goal, an even-strength tally and a powerplay marker over an 8:52 span in the second quarter. The 31-year-old forward drew the second assist on a late fourth-quarter goal by Curtis Dickson to give him 700 career points, becoming just the 22nd player in league history and the first Roughneck to hit the milestone. Dobbie put an exclamation point on the evening with a second shorthanded goal into an empty net for 701 regular season points in 151 games over 11 seasons. The seven-point outing also bumped Dobbie into first in team scoring with 35 points, one more than Dickson. Saturday’s victory marked Curt Malawsky’s 47th-career win as the Roughnecks head coach, making him the winningest coach in Riggers history after the late Chris Hall led the team to a 46-42 record from 2002 to 2007. Malawsky is 47-49 over six seasons since taking over the head coaching position in 2013. Malawsky is also the current assistant general manager and former associate coach and offensive coordinator for the Roughnecks, and won the Champion’s Cup as a player with the team in 2009. 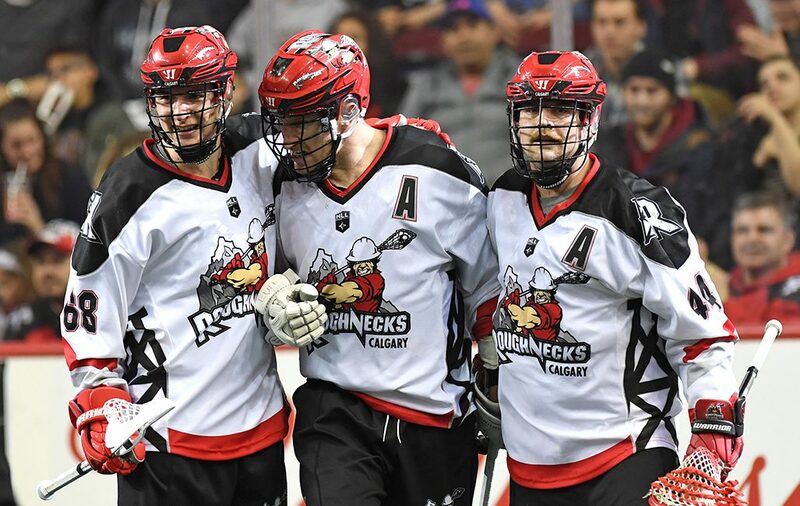 The Roughnecks offence has been heating up with 53 goals over their past four games and Dobbie and Dickson have been leading the charge, combining for 46 points over those four contests. With his seven-point performance Saturday, Dobbie now has 11 goals and 25 points in his last four outings while Dickson completed a hat trick and added two assists for 13 goals and 21 points over that span. Dickson has also scored the game-winner in each of the Riggers last two games. Dobbie’s two shorthanded goals against the Mammoth gave the Roughnecks seven shorthanded tallies on the season, moving the team into first in the NLL in that category. Dobbie, Dickson and Tyson Bell each have a pair while Riley Loewen also has one. All but one of those tallies have come at the Scotiabank Saddledome. The Riggers are also tied with Colorado, New England and Saskatchewan for fewest shorthanded goals allowed with three. The Roughnecks penalty kill ranks fifth in the league at 48.3% (14-29). Making his second straight start for the Roughnecks, the 20-year-old netminder made 51 saves for the win on Saturday night, including 15 in the opening quarter and 14 in the fourth. He was named the first star of the game for the second straight contest and has a 2-2 record on the season. Del Bianco’s 9.49 goals-against average and .807 save percentage are both tops in the NLL.